In a previous weblog we mentioned Donald C. Thompson's photographic assignment for Leslie's Weekly in Russia when he captured the leading politicians, filmed the demonstrations in the streets of Petrograd and in July 1917 went to the front to cover the summer offensive against the German army. Thompson's films were edited into his movie The German Curse in Russia. 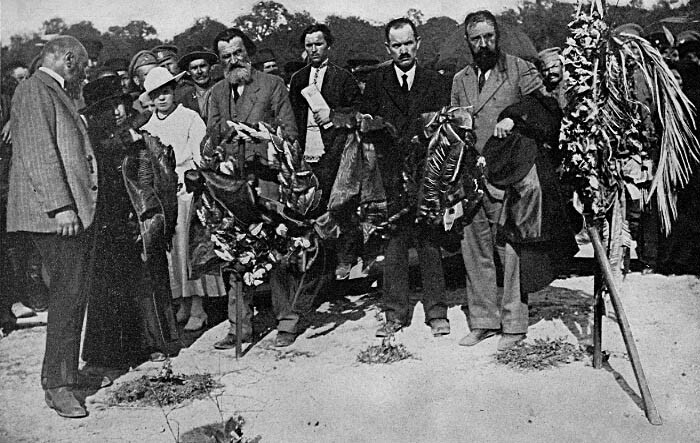 Caption from Thompson's book: "Here we see Lenin (far left) with his friend Trotzky carrying wreaths to place on the graves of those whom the latter called 'glorious martyrs of freedom.'" 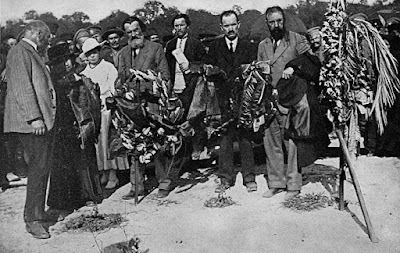 Thompson also claimed to have photographed Lenin and Trotski on July 15, 1917. Here is his personal account as published in his book Donald Thompson in Russia (1918). I went out to Lenine’s place and tried to see him and make a picture of him. I saw him after a wait of two hours and asked him to pose for a picture. When Boris told him I was from America, he told Boris to tell me he would have nothing to do with me and that we had better leave Petrograd. I told Boris to tell him that I was not going to leave Petrograd and that I would stay as long as I wished. I have made photographs of Lenine and a man named Trotzky who has come from New York. Trotzky I find a very mysterious man. He does not commit himself. Thompson claimed to have secured a major scoop with his pictures, saying he was the first foreign cameraman to have taken photographs of these historical Bolshevik leaders. In a recent post on Internet Mike Carey examined Thompson's photographic work and clearly demonstrated that despite a certain similarity these men were definitely not Lenin and Trotski. The reasons for Thompson's misrepresentation are not known. But considering his love for self-promotion the urge to stage some breaking news pictures may have been irresistable to Thompson. Mike Carey's post can be read here. As previewed in this weblog, the Historical Journal of Film, Radio & Television has published an article on how the only extant footage of Irish nationalist Sir Roger Casement was filmed during World War I. The article by authors Cooper C. Graham and Ron van Dopperen has been published online at the website of Taylor & Francis. The story will be published in print later this year. On 4 August 1916, the day after Roger Casement was executed, the Hearst International Film Pictorial Newsreel released moving pictures of Sir Roger at his writing desk. Although Hearst claimed that the films were shot in Belgium, they had been shot in Germany the year before. The authors have found the original film at the Library of Congress in the John E. Allen collection. A copy of the film has also surfaced in a British documentary series on World War I, from where it was posted on YouTube. But there was no information on how the film was shot in 1915 or the story behind it. The authors have also searched the provenance of the film. The story involves two Americans, Franz Hugo Krebs, journalist, and Albert K. Dawson, cinematographer, in the sad episode of Casement in Germany prior to the Easter rising of 1916 and his trial in London. Casement had been trying to enlist the Germans’ support in a general rising against England and the raising of an Irish Brigade. He had quickly found out that the Germans were simply using him for propaganda purposes. Nevertheless, he decided to assist Krebs and Dawson in their use of photography for his own propaganda aims. 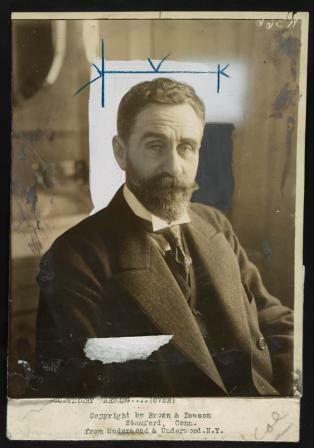 Aside from its undisputed propaganda value, the photo and film session became an important document of Casement’s life. Today, Casement receives increasing attention for his heroic struggle to speak out against all wrongs, not just those committed against Ireland. These films and photographs are in part a testament to this struggle. A copy of the full story can read and downloaded here.